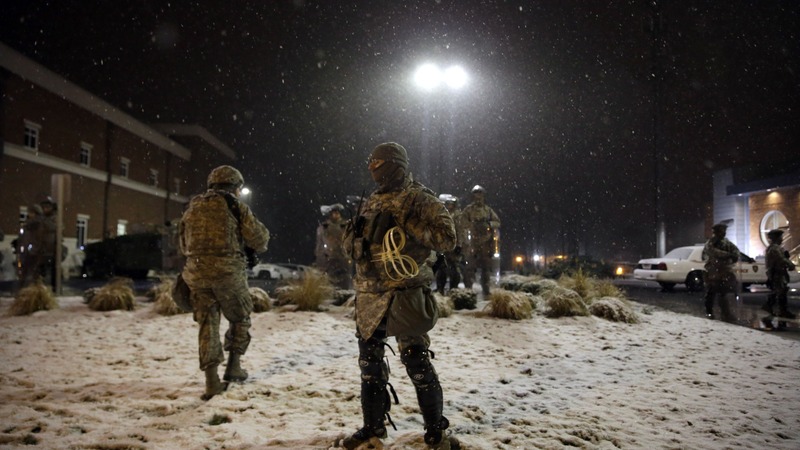 As snow trickled down on Ferguson Wednesday night, protests continued at the police department, a popular gathering spot for demonstrations in recent months, but a quieter, subdued tone blanketed the scene. Gone were the vandals torching cars and looting businesses, as protesters in thick jackets and hats lined the street near the Ferguson Police Department, which was being protected by the National Guard. Protesters chanted common slogans, including "Hey hey, ho ho, these killer cops have got to go." And there were moments during marches elsewhere in the city when protesters tried to block streets, but they mostly returned to the sidewalk, following requests by both police and other demonstrators. The same could be said of protests elsewhere in the country, with hundreds in Los Angeles calmly marching through downtown after being blocked from Union Station and the 101 Freeway by police. The protesters, whose voices echoed throughout the closing mall, remained peaceful and a reporter on scene noted that few police came inside, although authorities did respond to the demonstration. News broke Wednesday night of an alleged plot to bomb the Gateway Arch in St. Louis and kill St. Louis County Prosecuting Attorney Robert McCulloch and Ferguson Police Chief Tom Jackson. Earlier in the day, police used pepper spray to disperse demonstrators at Ferguson City Hall, who were chanting "We are not unlawful," according to the St. Louis American. A police spokeswoman told the newspaper that police used pepper spray after a city marshall was assaulted.